OnLive released Wargame: European Escalation to the marketplace as a PlayPass title. The game is priced at $39.99 in the US ($27.99 PlayPack) and £29.99 in the UK (£20.99 PlayPack). The game is currently also 30% off on OnLive and you can get it for $26.79 in the US ($18.75 PlayPack) and £20.09 in the UK (£14.06 PlayPack). Wargame: European Escalation is a real-time strategy simulation game published by Focus Home Interactive and developed by Eugen Systems, which is more known for their Ubisoft published RTS game R.U.S.E. The game also uses an improved version of R.U.S.E. 's IRISZOOM engine. Wargame: European Escalation is an intense and spectacular real-time strategy game, where realism and strategy are brought to the front lines. With a phenomenal range of vehicles and units (over 350 different models), build your army and enter a huge military campaign across Europe of the 80's, as the Cold War is about to become World War 3. With the powerful IRISZOOM, Wargame offers breathtaking graphics and battles as spectacular as they are strategic. Prepare to bring hundreds of units of all kinds--tanks, helicopters, squad Infantry, etc.--under your command in intense battles on gigantic maps stretching up to 60 square miles! Set in the rarely explored Cold War period of 1975-1985, Wargame: European Escalation explores the battles 'that could have been' if history had taken the wrong turn at some point in the conflict. On both sides of the Iron Curtain that tears Germany in two, the two military alliances, NATO and the Warsaw Pact, are on the verge of war. The zeal of a patrol close to the East-german border eventually leads to a firefight with their enemy brothers. Soon the local skirmish pushes the already-tense relationship between NATO and the Warsaw Pact over the edge into all-out war. Both superpowers have enough nuclear fire at their disposal to annihilate all life on the planet, but of course this is the very last resort; if an open conflict was to happen, it would take the form of conventional warfare in Germany, and throughout Europe. The world is about to fall into the feared 3rd World War. Wargame: European Escalation plunges you into the midst of this conflict, through a big and explosive military campaign! With rare strategic depth, Wargame: European Escalation stays accessible, and gives all strategy fans, beginners and experienced players alike, a unique, innovative and realistic gaming experience. Whether solo-playing through a large campaign or fighting against other players from all over the world, reflection and situation awareness are determining factors for victory. Players will have to account for numerous parameters, such as covers, supplying and refueling, and morale, which influence the abilities of their units. They will also have to make good use of recon in order to discover what their opponents are planning and to plan their own tactics and battle plans accordingly. Every one of the over 300 units in the game possesses realistically rendered performance and behavior. Players must monitor which weapons systems their units may use, allowing or forbidding certain weapons in order to save precious ammunition. This allows users to tailor their battle strategy to a given situation; it is particularly useful in stealth maneuvers, in which a player could forbid the use of weapons until his troops are at close range and then take his enemy by surprise. When a unit fires a weapon, many parameters (including the optical systems used, the experience of the unit, if it or its target is moving or stationary, and whether it already had fired at this target before) are taken into account in order to determine the probabilities for each weapon system to hit their targets. Wargame: European Escalation also offers localized damage. For instance, if you take an enemy's armored formation from behind, you will surprise the opponent and inflict maximum damage on his tanks, which have lighter armor at their rear and flank. It's also possible to inflict critical hits that temporarily or permanently damage some embarked systems. The crew of vehicles is also prone to be hit, making a seemingly intact unit impossible to operate. Morale is another important battle parameter. It is possible, with a barrage, to destroy the morale of the enemy units. Even if they are not destroyed, they will see their abilities reduced and, under the stress, will be much less efficient in battle. The individual experience of units plays a critical role in the outcomes of battles. During missions, units gain experience points. A small amount of experience is given to your troops for every successful shot, while the total destruction of an enemy unit gives much more experience. The more expensive and experienced the destroyed unit was, the more experience is earned! Along the battles, your armies will level up through 5 experience levels, from mere rookies to elite units. During the solo campaign, all surviving units will follow you from mission to mission. You will have to protect them in order to benefit from their earned experience in the long run. An experienced unit will not be more powerful or resilient than a similar, rookie unit, but it will be more lethal because able to act more efficiently. It will be much more accurate with its weapon systems, will spot enemies faster, and will also be less prone to lose morale and abilities under heavy fire. Used with wisdom, a veteran unit will be able to face several units and still be victorious. In order to support your assault troops, artillery plays an essential role. Though shots are quite inaccurate at first, they slowly gain precision and focus. If an allied recon has a direct line of sight on this target, the shot correction will be much faster. But the artillery has its downside: ammunition heavy, it will need a regular and frequent resupplying, and will be more efficient when placed next to a Forward Operational Base, which means a depot of ammunition and fuel. This makes it a very easy target for the enemy to spot. In order to maintain the combat ability of your forces, you will need to resupply them. You will have to maintain the stability of your terrestrial and aerial supply lines in order to repair damaged units and provide them with fresh ammo. This will also allow you to make sure your vehicles do not run out of fuel, as everyone knows a stationary tank is a sitting duck waiting to be destroyed. When facing an opponent heavily outnumbering you, attacking his supply lines becomes a particularly viable tactic! By taking position on specific key areas and on the battleground, you are able to gain command points and control reinforcement zones. Attacking becomes gratifying, as it allows you to call in for reinforcements, fresh units replacing your losses and changing the course of battle. However, only the fragile and costly command vehicles are able to claim to such areas, and you will have to protect or hide them if you do not want to see your last hopes of victory slip through your fingers! Wargame: European Escalation is powered by the second generation of the performing IRISZOOM engine. This powerful and high-performance engine allows the game to deliver spectacular clashes rendered in incredible detail. The IRISZOOM is able to render up to 100 million scenery objects on maps as large as dozens of square miles. The impressive zoom feature allows you to dive down in an instant, without any transition, to the heart of battles involving hundreds of tanks, helicopters, or infantrymen, in order to follow your units during the fight. This is a grand visual showcase that takes life before your eyes. 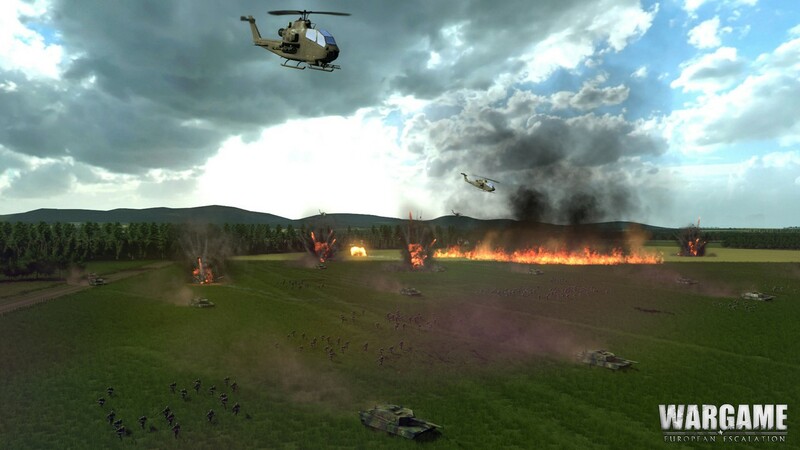 From the explosions to the lighting, the raging fires to the high-resolution textures, and the sound effects to the numerous post-processing effects, everything has been designed and developed to produce a photo-realistic rendering of the battlefield. This is complemented by highly detailed models of more than 300 different playable units: tanks, ground-assault helicopters, infantry, anti-air defense pieces, artillery, transport vehicles, supply trucks, recon units... all boast their own models, rendered in very high detail and faithful to their real-life counterparts. Zoom down from the sky to reveal even the smallest bolts and tank treads! Flying units also have their own flying models and move in the more realistic way above the battlefield. In addition to its deep and tactic gameplay, Wargame offers a particularly impressive and spectacular visual experience. Never before has a strategy game seemed so realistic! Wargame: European Escalation provides a multiplayer experience as rich as the one it offers through its solo campaign. Online service EugenNet provides a full multiplayer experience with creation of clans, organizing games, and world rankings where up to 8 players can compete simultaneously in massive battles involving hundreds of units! Friendly games are possible in order to take part in a short and fun skirmish between friends, but competition is also very present, with official rankings supported and calculated through an Elo system. Develop your tactics and unlock new units in order to add them to your 'deck' for you next battles. Will you choose a crushing strategy with huge numbers of weak yet cheap tanks, or will you try and manage small squads of expensive but skillful elite units? With more than 300 units with unique characteristics, tactical possibilities and strategic combinations are nearly unlimited. Wars of harassment with fast but fragile units, choking techniques by attacking the enemy supply lines, squashing under overwhelming numbers; all strategies are viable if you plan carefully! In the end, only the tactical acuity of the players will determine the outcome of the battles. Do you have what it takes to reach the higher echelons of the official world ranking? Online services provided by EugenNet allow Wargame: European Escalation to benefit from a complete and easy-to-use multiplayer experience. Create your team or organize tournaments between several players and teams! From 1vs1 to 4vs4, all versus configurations are possible! You can play the free demo and buy Wargame: European Escalation for the US powered by OnLive. You can play the free demo and buy Wargame: European Escalation for the UK powered by OnLive. Did you know you can create short urls with AdFly and earn money for every click on your short urls.